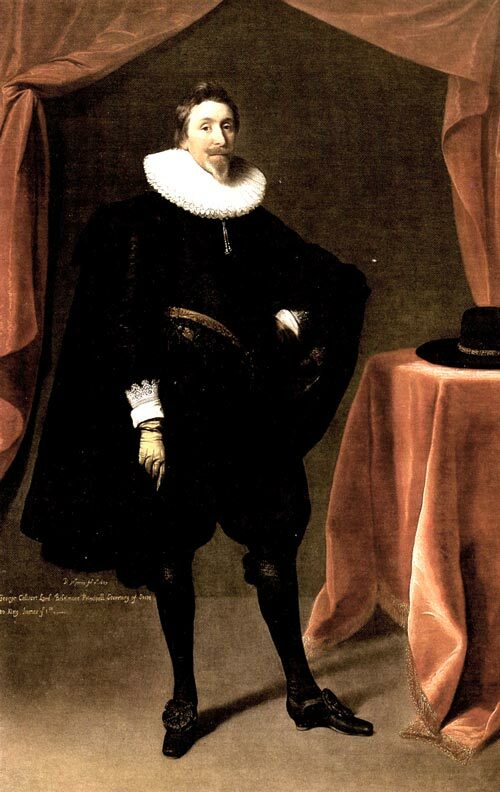 In 1620 George Calvert, Secretary of State to James I of England, obtained a parcel of land on the southeast coast of what is now Newfoundland's Avalon Peninsula. In August 1621 the first eleven settlers arrived to begin construction of the Colony of Avalon. Calvert resided at Ferryland for two years, from the summer of 1627 until the winter of 1628/29. The most extensively explored part of the original Colony of Avalon is the eastern portion of the waterfront, probably completed during the early years of settlement. The first construction was a sea wall that bordered the southern edge of the Pool. The present-day land to the north of the sea wall has all been deposited since the 17th century. At its eastern end the sea wall abuts an earlier (probably by only a few months or years) north-south wall that forms part of the defenses of Avalon and borders the eastern edge of the harbour. More than three meters of overburden, and the proximity of the present road, made it impossible to trace more than a few meters of this wall. It is not known how far to the north the wall extends. Along the edge of the Pool the sea wall is visible during extremely low tides. 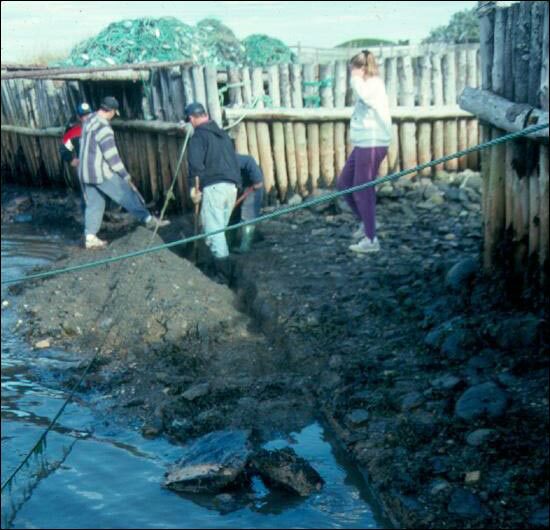 Here a portion is being exposed so that it can be recorded. The sea wall makes a turn to the south to form a small slipway or inner harbour. 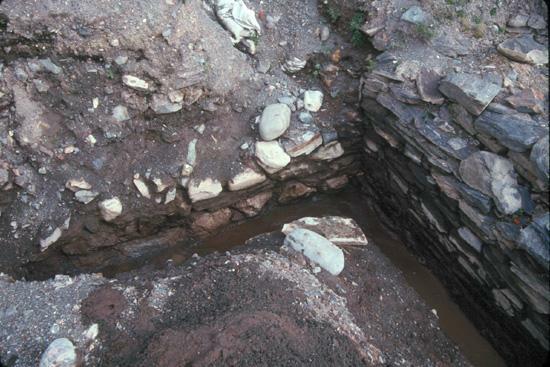 Here a corner of the stone construction is shown after several courses of rocks have been added to the original remains to bring it above the level of high tide. 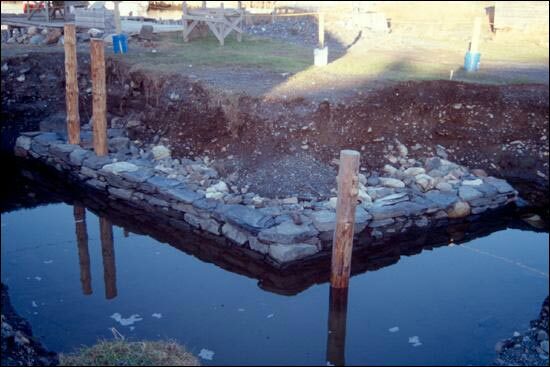 The posts were placed in the post holes from which the remains of the original posts were removed. 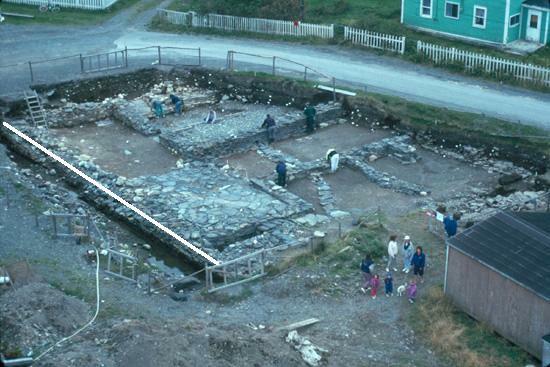 Among the buildings constructed during the early years of settlement was this large stone warehouse measuring about 56 feet by 16 feet (inside). The walls were of stone and the building was roofed with slate. The western end was paved with flagstones while the east end had a dirt floor. 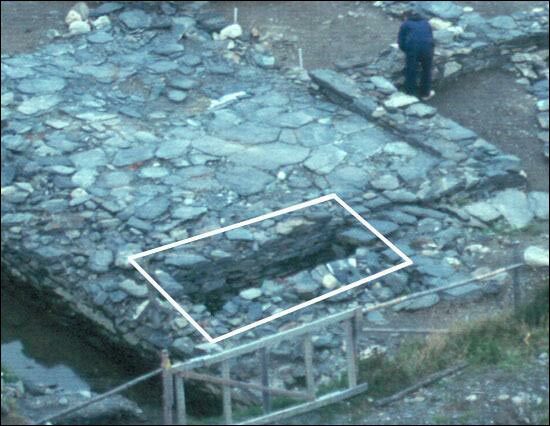 A small door on the south side was probably matched by a large loading door facing the harbour, where small ships and boats could be loaded and unloaded. 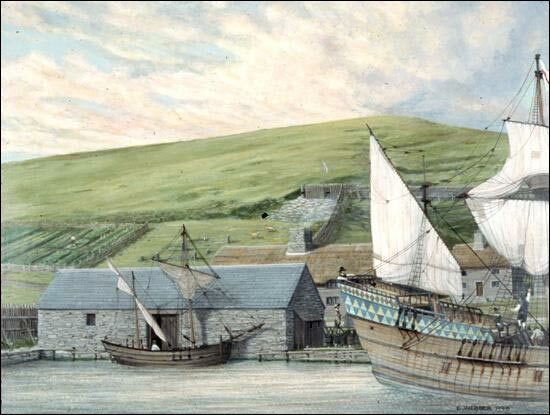 This painting by David Webber shows the Avalon waterfront as it might have looked about 1625. Prominent are the sea wall bordering the harbour and the stone warehouse, both built during the early years of Avalon. In the background can be seen the bastion at the southeast corner of the settlement and kitchen garden outside the palisaded village. At the western end of the warehouse is a stone-lined privy. It measures about nine feet by four feet and is about four feet deep. 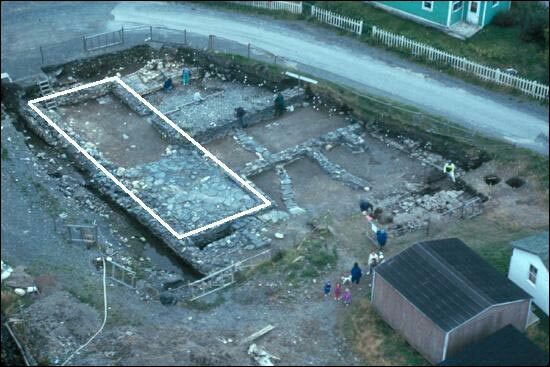 The privy is within the white rectangle. The privy contained a matrix of rich organic material in which a variety of organic deposits was preserved - including the eggs of several varieties of human intestinal parasites. 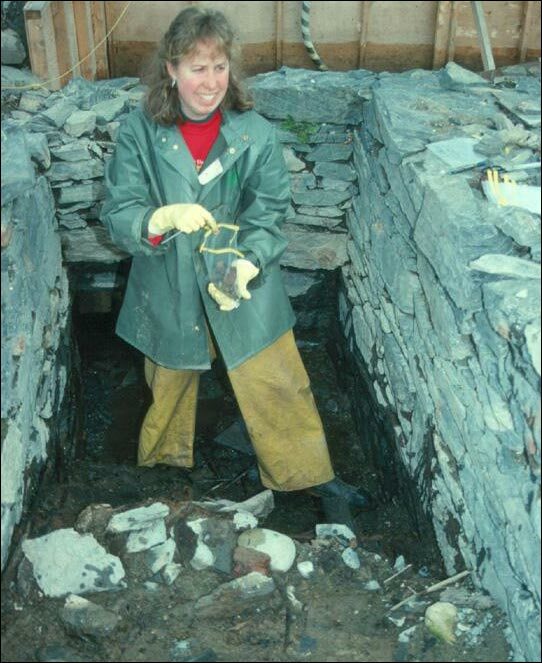 An archaeologist collecting a matrix sample in the stone-lined privy. 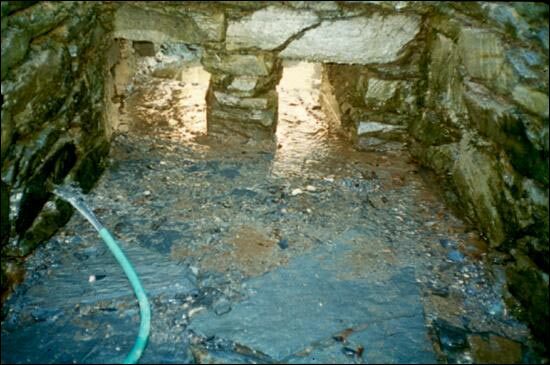 The privy was equipped with drains (see first image below) through the sea wall that admitted the rising tide twice each day to "flush" it. 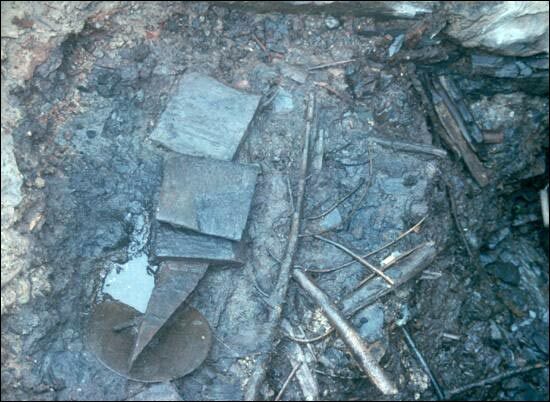 The system did not work perfectly, for eventually a large number of artifacts and other objects accumulated. Shown in the second image below are offcuts from barrel manufacture, sticks, twigs and other organic objects. 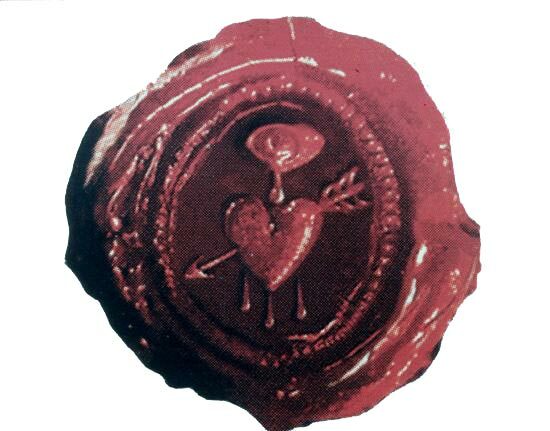 Near the bottom of the privy was found a shellac seal depicting a heart pierced by an arrow and a weeping eye. It may be a religious motif or may simply represent melancholy, a not uncommon motif of the 17th century.